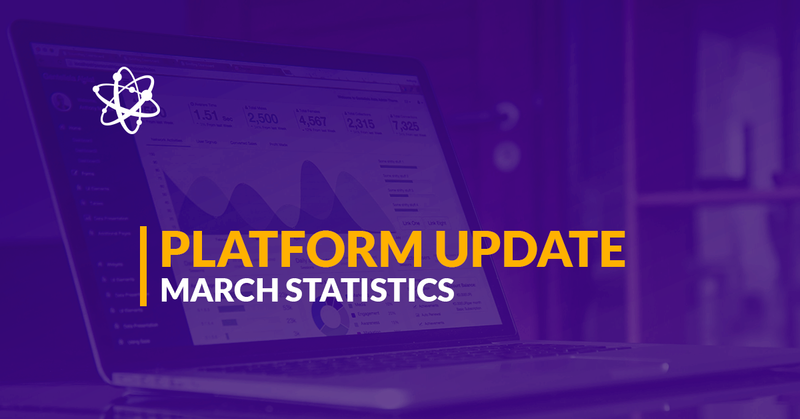 It’s the second week of the month and a time to look through the statistics on the Debitum Network platform for the previous month. We saw slow, but steady growth in all the respective fields. In some areas, the increase was minor, in others more profound. The advance is not stalling at any point and this gives us an optimistic view for the upcoming months as preliminary agreements are prepared with new loan originators, talks are made with bigger institutional investors and Debitum Network gets more exposure among P2P and P2B bloggers and influencers. 137 new users joined our platform last month. The total number grew from 1618 in February to 1755 in March, which is 8.47% growth in a month. 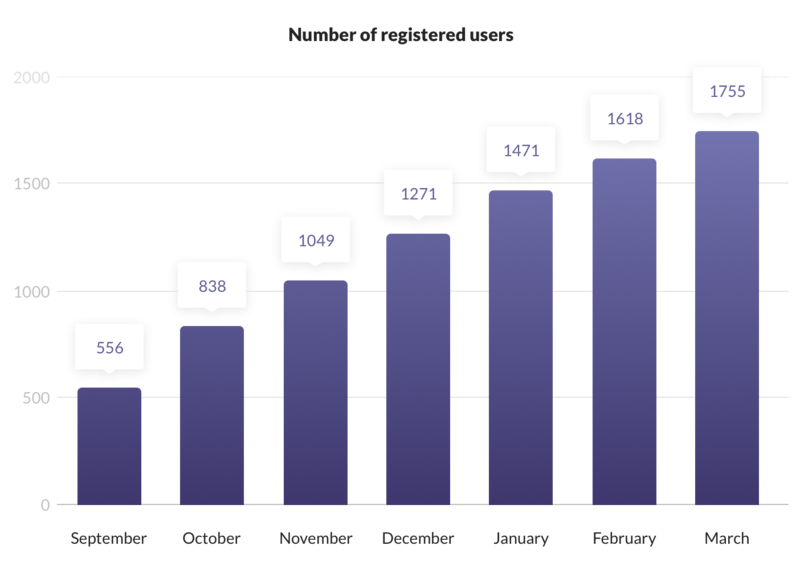 With 556 users in the launch month that is a 215.6% increase in the period of 7 months. We expect the number 2000 to be reached in April. Registration on Debitum Network platform is free and takes just one minute. You can register and see for yourself what functions and features are there, learn more about the borrowing companies, loan originators, risk ratings, financial statements and many more. Money deposits saw small growth last month. The users added 35,176 Euros to their accounts and the total number of deposits grew from 533,824 Euros to 569,000 Euros, which is 6.59% growth in March. 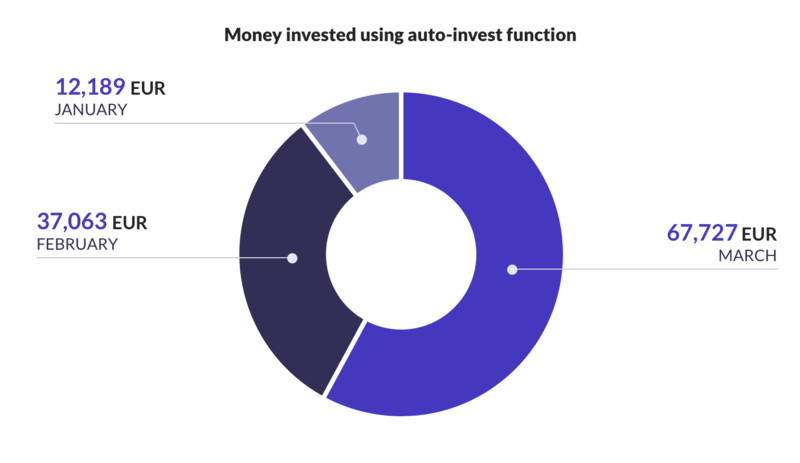 We expect the number to increase significantly with the onboarding of institutional investors who would invest larger amounts in the nearest future (we constantly try to attract institutional money to our platform). You can experience what investing in the assets and making interest on our platform is on your own by depositing the minimum of 50 Euros (from SEPA accounts or British Pounds (GBP) from local accounts, and US Dollars (USD) from US-based accounts)). The minimum investment into an asset is just 10 Euros. You can leave any time after the asset you have invested in is repaid. All transactions in the assets are done in EUR. After a record-breaking month of February in terms of investments, there was a minor slowdown, though overall, the upward trend remains intact. Investors put 255,350 Euros into various industries. The total number of investments grew from 1,280,000 Euros to 1,535,350 Euros. 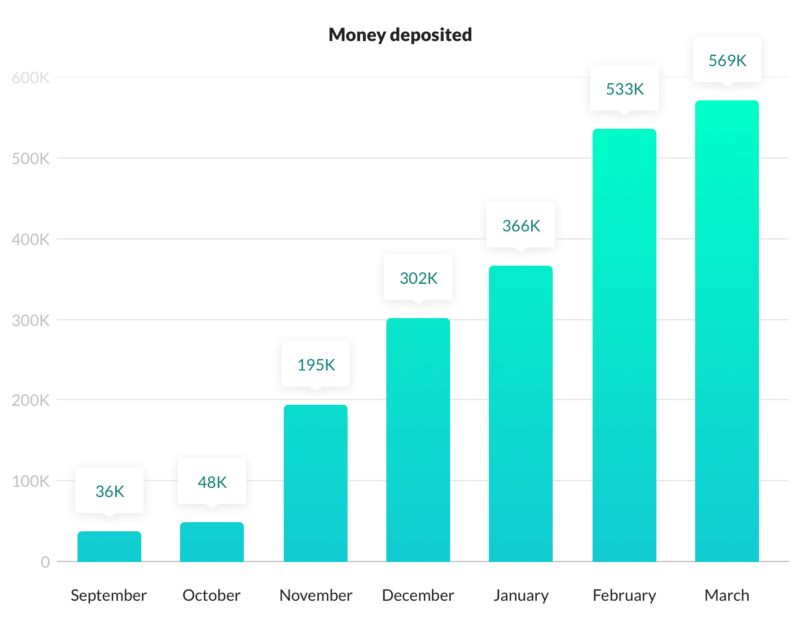 That is 19.95% growth for the month and 4,165% increase from the launch of the platform 7 months ago. 2 million Euros target is within the reach and will likely be hit during the month of April. Wholesale industry kept its’ leader role among the industries. In fact, investments in the assets of the industry soared from 41.5% (of all investments) in February to 60.65% (of all investments) in March. Attractive interest rates in the industry are probably the main reason for such huge interest in the assets. The second place was taken by ITT industry assets. Those had slightly lower interest rates than the Wholesale assets. 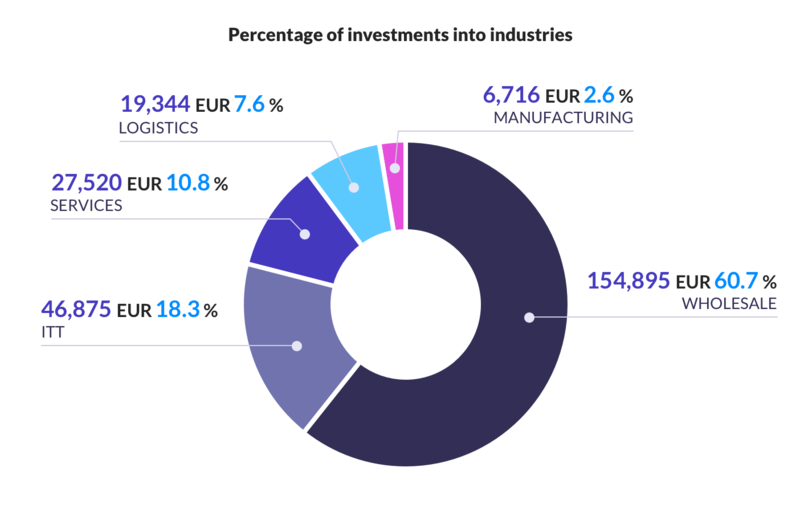 We do expect to have higher interest rates from various industries as more loan originators onboard Debitum Network platform in the nearest future. Usage of an auto-invest feature is slowly, but surely becoming popular among investors. 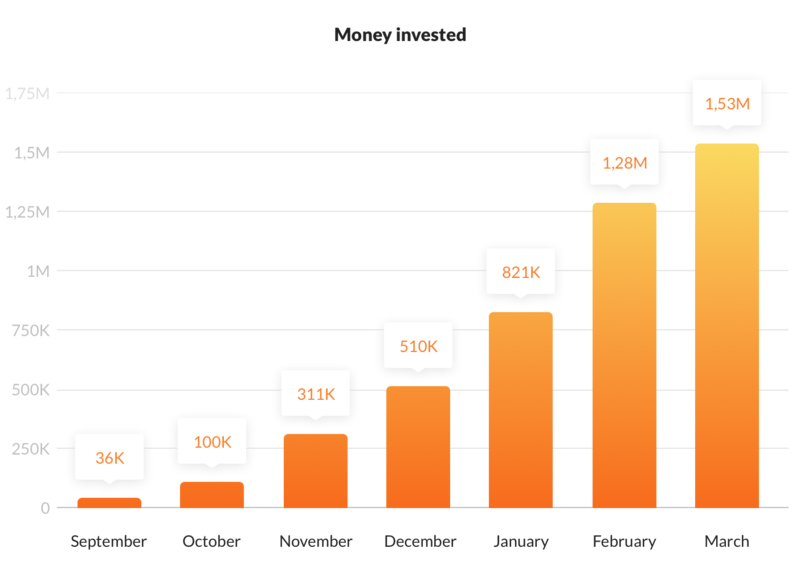 There have been just 3 months since the launch of auto-invest feature and we still expect it to gain way more traction with an increasing number of assets on our platform. 30,664 Euros were invested using the feature in the month of March (From 37,063 Euros in February to 67,727 Euros). That is 82.7% growth in the usage of the feature. As manual investing consumes a lot of time, and the possibility to earn compound interest is an attractive opportunity that Debitum Network platform offers for investors, most investors will eventually choose the feature and not keep their money idle waiting for exclusive offers. In March we onboarded two new risk assessors on our platform – Creditinfo Estonia, a leading service provider for credit information and risk management solutions and CrediWeb from Latvia – one of the favorite risk assessors among largest Latvian companies. They will help us to provide automated and accurate risk rating for business loans uploaded on the platform from Estonian and Latvian SMEs. Debitum Network is now in business development and expansion phase. We are working to onboard new loan originators, risk assessors, and due diligence parties. 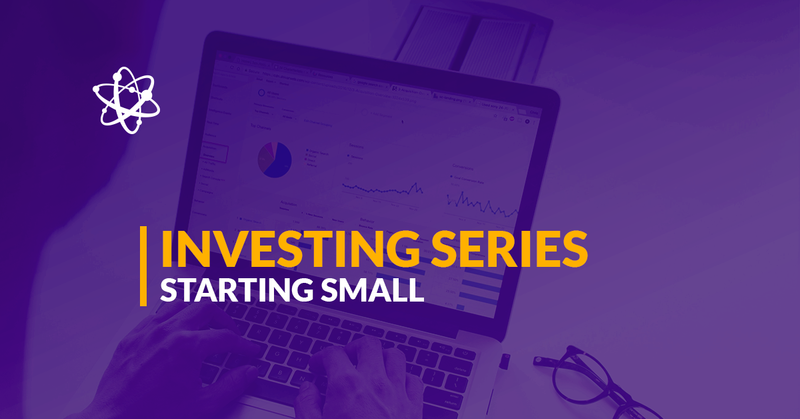 This adds more security to our investors as well as more opportunities to invest and earn attractive interest rates as well as compounding interest rate with every new investment in the asset. Would you be willing to try our platform? Amounts are flexible and you can leave any time you want. If you haven’t joined our platform yet, it is a good time to do it.